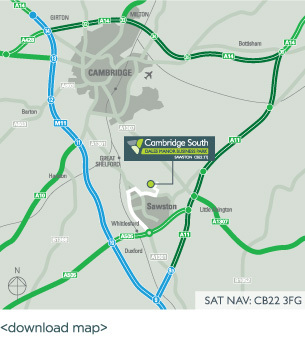 Our 13 new industrial, warehouse and business units are situated 7 miles south of the University City of Cambridge. Sawston enjoys a catchment population of 19,000 people within 3 miles of the site. The town centre provides a broad range of amenities including a supermarket, building society, bakery, and a range of shops, pubs and restaurants. 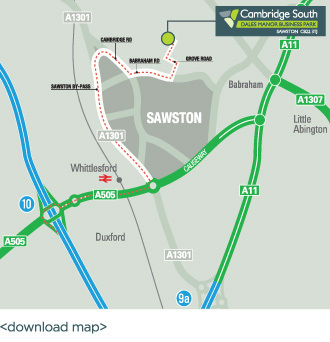 Sawston enjoys excellent road connectivity with easy access to Cambridge City via the A1307 and the wider region via the A505, M11, A11 and A14. Mainline rail links on the Cambridge/London Liverpool Street line are available from the nearby villages of Great Shelford and Whittlesford Parkway. Services from Cambridge City train station run regularly in to London’s Kings Cross Station.